Maybe you noticed my posts were light this week. It’s been all kinds of crazy. So crazy I haven’t taken a single picture with my camera – only Instagram! The week started with a trip to Casablanca to pick up our boxes from the US that had finally arrived – several weeks late. (If you didn’t catch it, I shared a post with my 8 Tips for Making an Interntional Move with Kids on ChicagoNow a few weeks ago). We took the very early train from Marrakech to Casablanca at 4:30 am. It should have arrived shortly after 8am, perfect to make our 9:30am appointment. Except the train didn’t pull in until 9:45am. It was a great start to the day. The way it works here is that most shipments coming in you have to pay an import tax. We went to the American consulate in Casablanca before picking up our shipment and got a document that verified we changed our residency to Morocco. Now, I’m not sure if this paper alone is what allowed us to avoid import taxes, or if my husband’s citizenship + this paper allowed it but either way this paper ($50) unlocked some key to get our things here without having to pay import taxes. But we still had to pay fees to the handling company in Morocco and pay someone to bring our large boxes to Marrakech. On the bright side, I got to meet up with a wonderful lady from an English Speakers in Morocco group I’m a part of on Facebook and she took us to a convent in Casablanca of Mexican nuns that make real Mexican food. This sounds unimpressive if you’re reading from North America where tacos are a dime a dozen but here, it’s impossible to find Mexican food. We grabbed tortillas, flautas, and tortilla chips and can’t wait for the next time we’re back to buy more! If the Mexican food wasn’t enough, she also took us to a cupcake shop in the Casablanca Twin Center. I think this picture speaks for itself. So so good! Eid is just around the corner (inshAllah) we’ll be celebrating next Wednesday. The shepherds and sheep are making their way into the city and it’s become commonplace to see sheep taking rides home in all sorts of ways. In the back of trucks, on motorcycles, even on top of vehicles. I’ve yet to see someone walking their sheep home on a lead, though that’s what I would do! Yesterday we saw people had started to sell small bundles of bedding greens for the sheep. Our roof and upstairs rooftop room were cleaned out last week to get ready for their (brief) animal inhabitants. Thursday I had a “girls” date with Mandy of Why Morocco. She’s a Canadian expat here in the city and is much more well versed in what’s what than I am yet. I finally was able to get a pedicure, and enjoy an easy conversation! It’s pretty stressful trying to speak and understand a foreign (or two foreign) languages at all times. Very nice to relax and have a fluid conversation. We went to lunch at 16 Cafe on the Marrakech Plaza. It was a really welcome reprieve from the often limited choices. I had this really delicious salad of greens, endive, raisins, walnuts, and fried chevre on toast points with a honey dressing . Believe it or not – this is the small size! Friday I was able to meet up with the Journey Beyond Travel team to have some in person conversations and eat some great food. We went out for dinner to Bistro Thai, a great Thai restaurant in Gueliz. 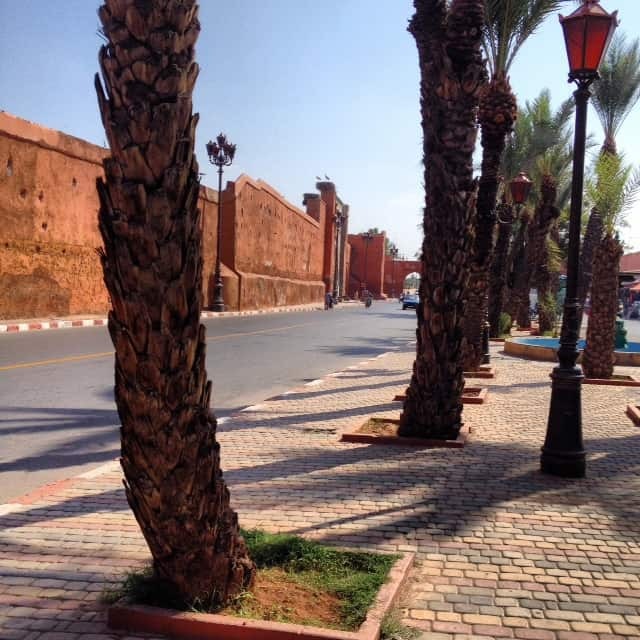 Honestly, I was skeptical – Thai food in Marrakech? It was absolutely wonderful! I am planning to take some friends there next week again. We’ve been told they have live music (jazz) some evenings and it really fills up. So if you’re visiting, give them a call for reservations but I promise you a great environment. delicious food, and reasonable prices. Finally, I’ve been sick for several weeks now, which is one of the reasons there have been fewer updates. At first I thought it was just the water or something I ate and fought through waiting to feel better. But I didn’t feel better, not even a little bit. MarocBaba finally convinced me to go to the doctor, and I felt awful enough to give in and go. I had lost almost 20 pounds since we moved here and the doctor told me my gallbladder was full of small gallstones. That was why I was so sick. There are some very good doctors and clinics here and we both spent a lot of time talking and considering what we should do. Having had a gastric sleeve just a little more than a year ago and knowing there aren’t a lot of surgeons here who are well versed in the procedure we hesitated to have just any surgeon perform this fairly routine procedure. We also realized it would cost about the same to have it done here, as it would for me to fly back to the US and have it done. Ultimately, we decided I would return to the US for the operation. So in about 10 days I’ll fly back to the US and spend 3 weeks having the surgery and recovering. I probably won’t be cooking up a storm but have plenty of things I’ve yet to share with you! My kids have already started to make a list of the things they wish they would have brought with when we first came. As for me, I’ll just take a bowl of my mom’s chicken soup. pasing Ecole La prairie (it is directly behind here) the first to your right, and again the first right. They speak some French and fluent Spanish. You poor thing! I hope you feel better soon and that your recovery is very quick! My heart skipped a beat when I saw Khemisset on the sign. I know that place! 🙂 And Mexican food in Morocco? Sounds like I should have made friends with your girlfriend when we were there! Hugs and best wishes from Copenhagen! Morocco is one of my favorite places. We were there last Sept/Oct. I miss it, and really enjoy reading yoru blog and see the photos – especially the food. Sorry to hear you are so sick. Hope you recover quickly. Wow – lots of news. Hope you feel better soon – not something you needed right now, but thank goodness you can go back to the US for an operation! Sorry to hear that you’ve not been well. Wishing you a safe journey & a speedy return to health. Thinking of you lots and wishing you a swift return to health. You are precious!